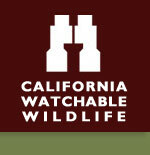 Background: California's largest stand of valley oak riparian forest borders the largest undammed river. A trail passes a young, restored riparian forest, then moves to reconstructed marshes that attract wintering tundra swans, sandhill cranes, and scores of ducks. Long-billed curlews and other shorebirds forage in pastures and wetlands. River otters, beavers, and muskrats swim in cattail-lined sloughs, passing green herons and wood ducks. Riverside willows, blackberries, and wild grapes give way to an oak-studded savannah, areas favored by black-tailed deer, Nutthall's woodpeckers, and western bluebirds. The tallest trees bear the spring nests of Swainson's hawks. The River of Skulls trail winds through riparian forest along the lower Calaveras River. The interpretive brochures, provided at the trail head, give the visitor insight into the life of the Miwok Indians that lived along the river. The campgrounds are located in the oak savanna woodland where there are many opportunities to view the local wildlife, especially raptors, songbirds, squirrels, rabbits, and deer. At night coyotes can be heard calling to each other and bats can be seen catching insects in the night sky. The Habitat: Most of the land at New Hogan is oak savanna woodland with blue oak and foothill pine. Some areas are covered with dense stands of chamise. There are riparian corridors are along the Calaveras River both above and below the lake. These areas have dense stands of California willow and blackberry. Other common trees are Fremont cottonwood, black willow, interior live oak, alder and California walnut. The Experience: The lower Calaveras River is home to steelhead and Chinook salmon, which are protected species. The lake is a winter home for bald eagles and Swainsons hawks. Also, there are a large number of western blue birds in the area. Wildlife and Where to Find It: Car, camping and picnic sites, boating and trails offer viewing sites. Site Notes: This secluded, hilly expanse of oak woodlands, grasslands, and chaparral has a combination of recreational opportunities for everyone. Hiking, biking, boating, fishing, hunting, and camping are some popular activities. Observation Point, located just above the dam, offers a spectacular view of the lake, perfect for birding. Also, make sure to stop in at our new Visitor Center. Seasonal: Some camping and group areas are closed seasonally. Call for exact closure dates and facilities. How to Get There: From Valley Springs, CA: Travel south on CA-Hwy 26 for 0.5 mile, Turn left (east) on Hogan Dam Road for approximately 2 miles to the Park Headquarters.